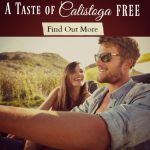 Join us in our Calistoga bed and breakfast for the getaway of a lifetime. Featuring eight delightful rooms all with private baths. 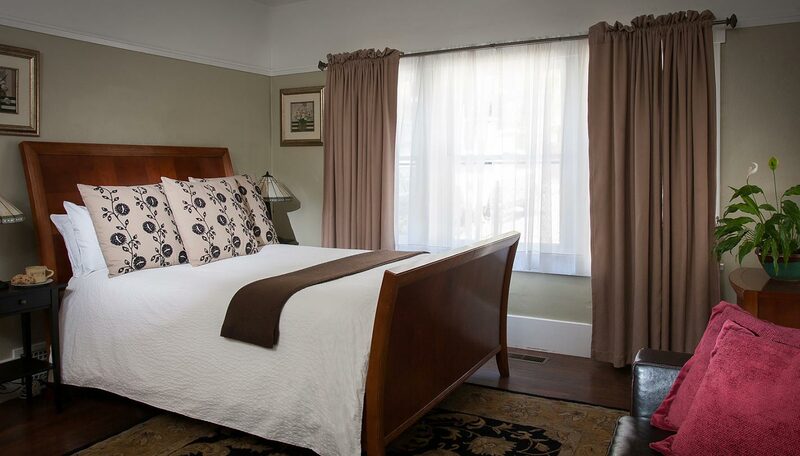 All guest rooms in our Calistoga Bed and Breakfast inn are thoughtfully decorated with peaceful colors and soft furnishings that complement the original turn of the century style. English and American antiques add the finishing touch to these romantic rooms. You may even find the “secret drawer” where guests have left notes with many colorful memories over the years. 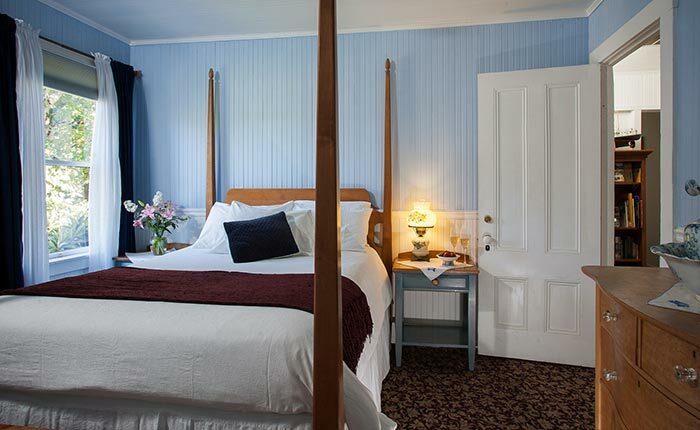 This cozy room at Wine Way Inn on the upper floor, is light and airy with a queen size bed. The Ralph Lauren Nautica theme is accented with whimsical ships and decorative appliqué mini quilts made by the innkeeper. 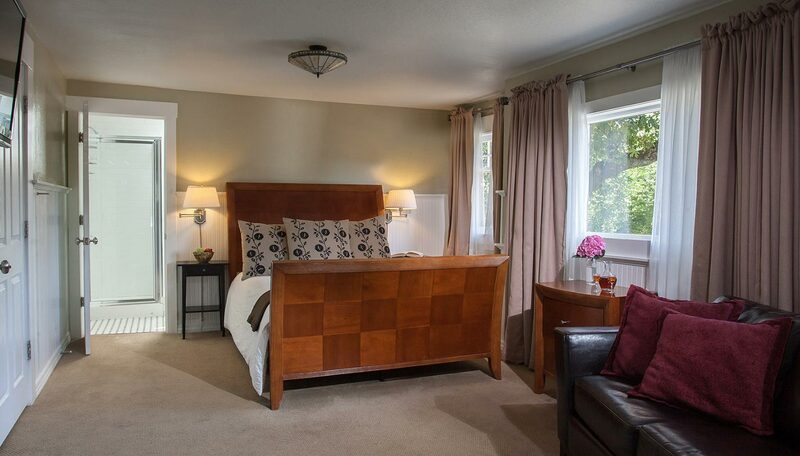 Located upstairs and situated at the side of the house, this charming room has a queen size bed. Maximum occupancy two people. Small private bath with shower. 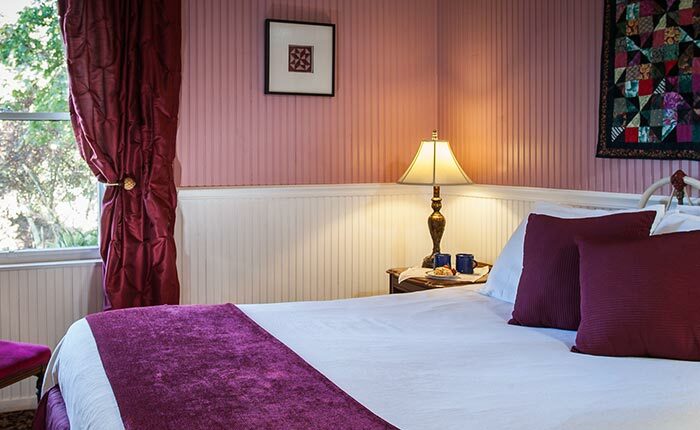 Upstairs, situated on the side of Wine Way Inn, this romantic room with queen bed is decorated in shades of warm pink and burgundy. Maximum occupancy two people. The private bathroom has a tub and shower. 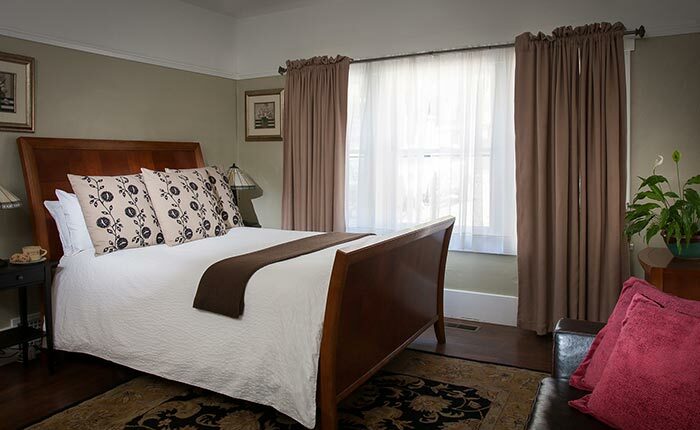 Upstairs at the side of the house, this larger room has a queen bed and can accommodate an additional guest with a twin size trundle bed (additional $35 charge). The compact private bathroom combines contemporary convenience with period elegance. Upstairs at the rear of the Wine Way Inn this room has a charming queen size four poster bed. Maximum occupancy two people. The patio door opens onto a small private area of the deck. 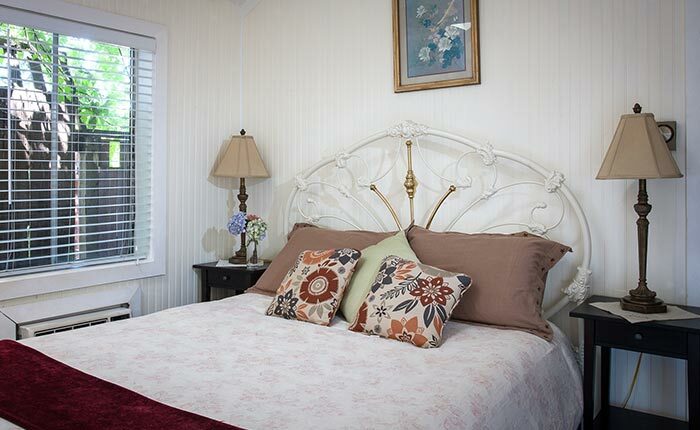 This separate romantic little cottage, with a queen bed, is accessed through the main house or from the deck. Maximum occupancy two people. The patio door opens onto a private garden area. 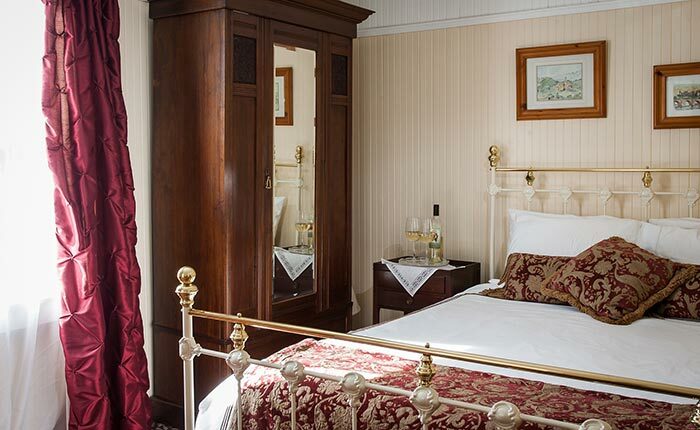 A luxury Wine Way Inn room with king size bed, fireplace, refrigerator, spa robes, large flat screen TV with huge channel selection and a seating area with two comfy chairs. Maximum occupancy two people. The luxury private bathroom has a jetted air massage claw-foot tub with a large separate shower with twin shower heads. This luxury room features a king size bed, fireplace, refrigerator, spa robes, large flat screen TV with huge channel selection and a separate seating area with couch that can be converted to a queen size sleeper. Luxury private bathroom with jetted air massage clawfoot tub and a large separate shower. 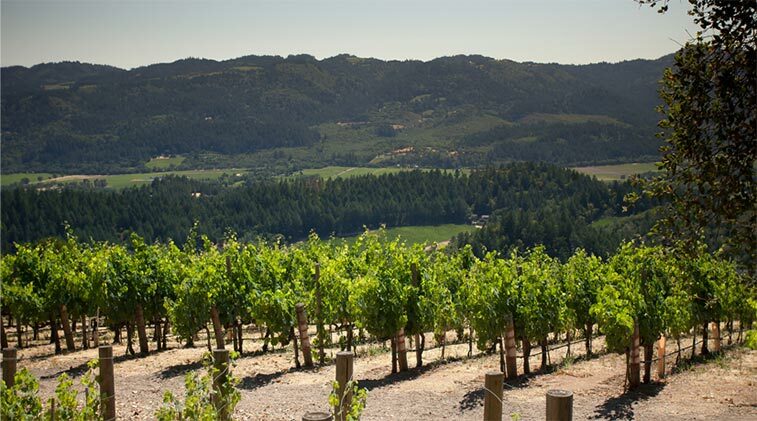 All the rooms are named for the mountains and cliffs that surround Napa Valley. As the peaks soar above the valley floor we aspire to bring you the pinnacle of comfort and enjoyment. 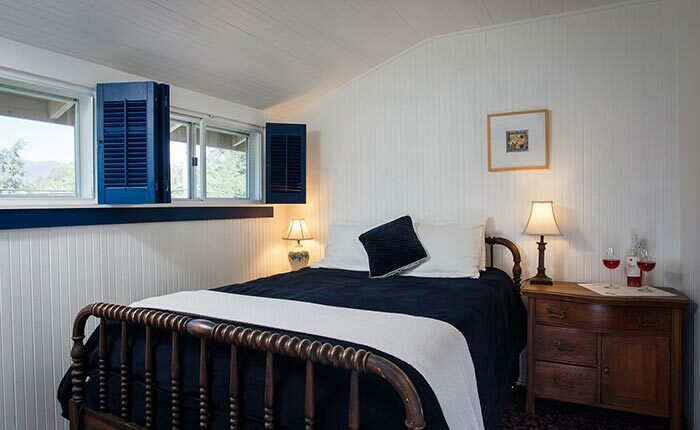 The spacious Palisades room, is upstairs, at the front of the house and retains many of the original Craftsman features of the house’s 1912 heritage. The bathroom has a large steam shower, while the room has relaxing window seats, a queen bed and a comfortable sitting area with a large leather sofa and flat screen TV. On the ground floor, the Howell room retains many of the original Craftsman features of the house’s 1912 heritage. This rooms boasts a queen bed, private sitting area, flat screen TV, sleeper sofa for up to two additional guests (at an extra cost of $35 per person per night) and a large steam shower. Upstairs at the side, the perfect romantic oasis. With an intimate private upstairs porch, king bed and comfy chair to catch up on your reading or to sit and enjoy a movie on your flat screen TV. Maximum occupancy two people. The bathroom has a Jacuzzi bath tub, twin sinks and a large separate shower. 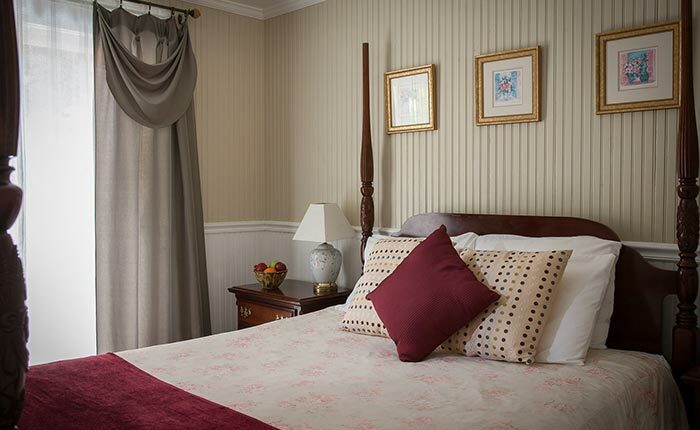 Upstairs, at the side of the house, with a king bed this room offers the perfect spot for relaxation and romance. In the morning enjoy the soft sunlight as you catch up on your reading in the comfy chair. In the evenings relax in the two person Jacuzzi bathtub with rain shower. On the ground floor, complete with lounging chairs, queen bed, coffee table and peaceful palms it’s the perfect spot to relax. Maximum occupancy two people. 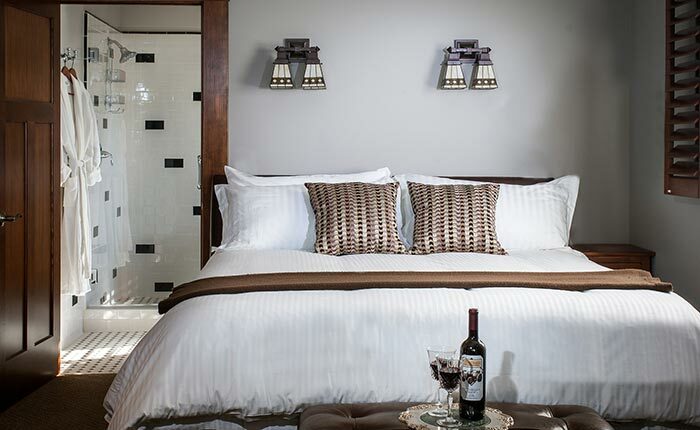 Catch up on your reading, enjoy a glass of wine or reserve a private massage for you and your partner. This room has a Jacuzzi bath and private curtained porch. 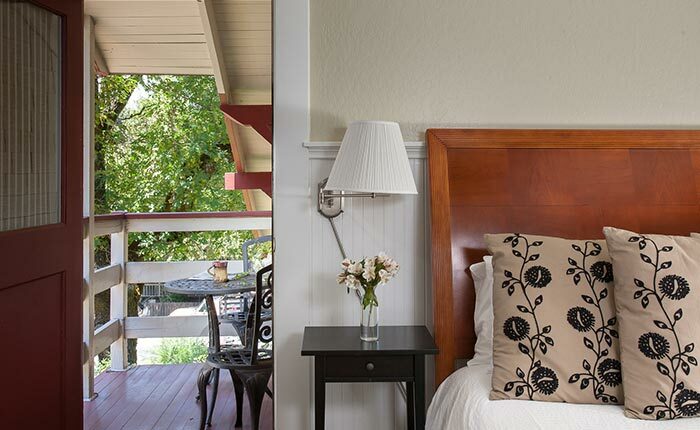 Each unique room in our Calistoga inn offers period elegance, tasteful and relaxing décor and many standard amenities. Rates vary depending on season and length of stay. Book direct with us for the lowest rates. Lowest rates are for midweek stays in the winter, highest rates are for weekend stays in the fall. 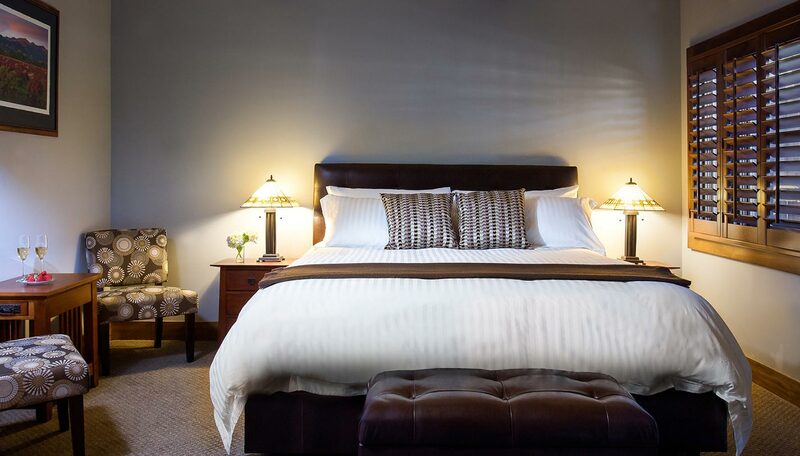 Room rates always include complimentary afternoon service of local wines, bottled water, WiFi, parking and our distinctive gourmet breakfast each morning. Here is the fine print. We have found over the years that it is best to spell out very clearly just what our policies are. As a very small family business, we need to charge cancellation fees to cover credit card processing fees and lost income from empty rooms. We do not like charging cancellation fees, please be sure of your trip before you book. If you are not sure of your visit or worried about cancellation charges, you may want to consider trip cancellation insurance. Deposits: A deposit of one nights lodging or 50% of your stay, whichever is greater, is required to secure your reservation. Cancellations: There is a $25 cancellation fee for cancellations or significant reservation changes outside the no cancellation period. One night stay, one room equals one week. Two-night stay, one room equals two weeks. Two-night stay, two rooms equals four weeks etc. Cancellations or significant reservation changes within the no cancellation period will forfeit the deposit paid. Any cancellation or significant reservation change within 48 hours of arrival day will be charged the full cost of the original reservation. Early departures will be charged the full cost of the original reservation. Booking deposits for the whole Inn or for wedding parties are non-refundable. Occupancy: All rates are single or double occupancy. All rooms are maximum occupancy two people except the St. Helena Room which can accommodate one additional person, and the Lokoya, Palisades and Howell rooms which can accommodate up to two additional people. Additional persons are $35 per night per person. Minimum Stays: There are no minimum stay requirements. 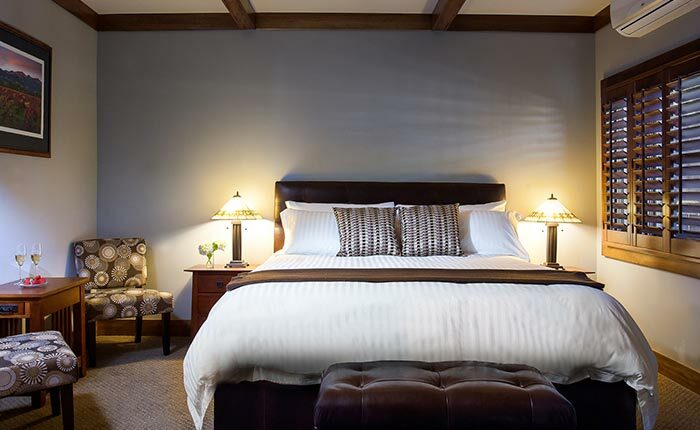 Single or two night stays at weekends, special events or holidays may be at premium rates. Pets: We ask that you do not bring your pets to the inn. If you arrive with pets, you will need to find somewhere else for them to stay or cancel your reservation for which you will be charged the full cost of your reservation. Children: Not all rooms are suitable for children. We want you, your children and our other guests to be comfortable. Please call us if you plan to bring children under 12 so we can guide you to a room selection that will ensure you have an enjoyable stay. If you bring younger children unannounced to a room that cannot accommodate them you will need to find somewhere else for them to stay or cancel your reservation for which you will be charged the full cost of your reservation. Smoking: Smoking is only permitted on the porches and on the deck. Please show consideration for other guests smoking preferences. Please do not smoke in your room or anywhere in the Inn. We will charge a minimum $500 cleaning fee if smoking has occurred indoors. 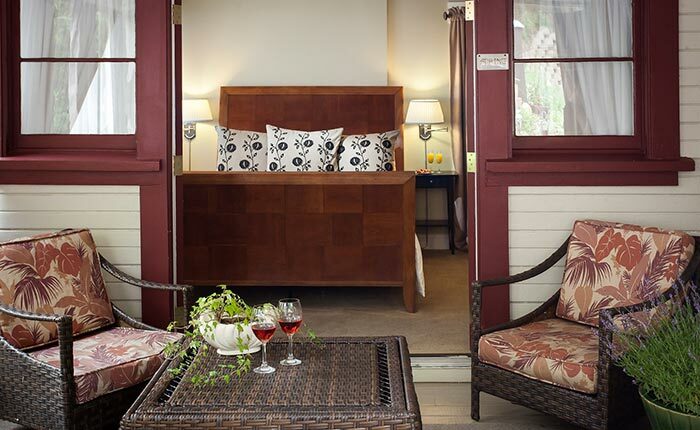 Accessibility Policy: Craftsman Inn and Calistoga Wine Way Inn warmly welcome all guests. However, due to the historic significance of both of our early 1900’s craftsman inns, neither is completely wheelchair accessible. Removal of necessary physical barriers for accessibility is not readily achievable in all areas as such removal would threaten or destroy the historic significance of the properties. Both properties have been renovated and inspected by local authorities indicating compliance with ADA requirements at the time of renovation. Although certain barriers exist, extensive efforts have been made to ensure all guests can enjoy the experience of our Napa Valley inns. Below is a list of barriers as well as descriptions to help those with disabilities. A ramp is available on the side of Wine Way Inn, but there is a step to enter directly into the Inn. A large walk-in/roll-in shower with two handheld shower-heads and fold-down shower seat. 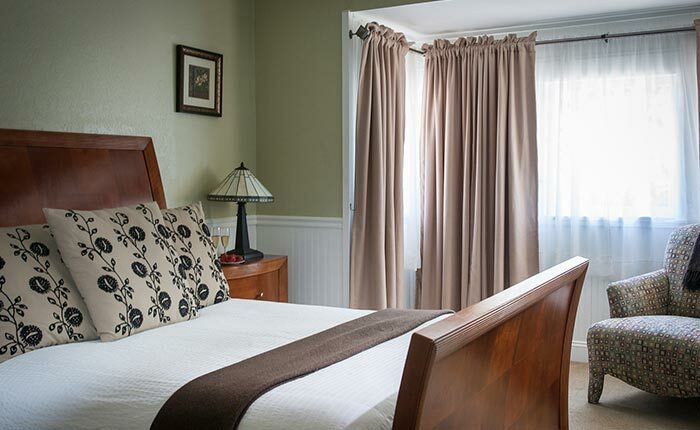 Craftsman Inn requires the navigation of numerous steps up to the entrance of the Inn. Commons areas: Once inside the Inns, there is access to the reception areas, dining, living and porch areas. However, not all doors and doorways are wide enough for a larger wheelchair. Please note: We do not have an elevator in either Inn to the second-floor rooms. We are happy to help you with your luggage. 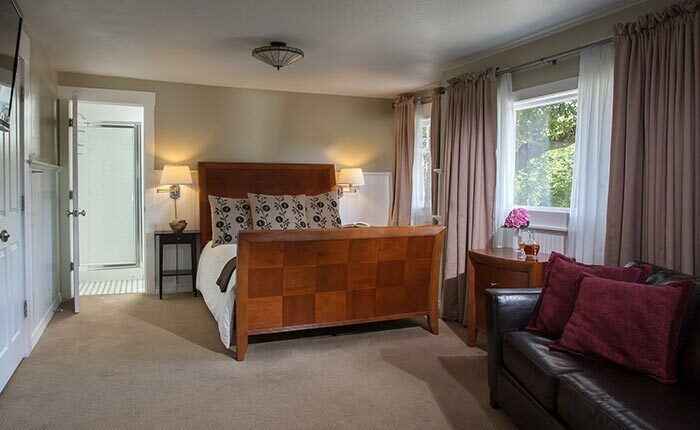 For special accommodation needs, please call us directly at (800) 572-0679 so we can help you determine the best guest room to ensure you have a comfortable arrival and enjoyable stay. 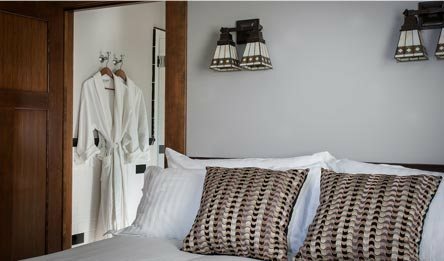 Website Accessibility: Craftsman Inn and Calistoga Wine Way Inn are committed to facilitating the accessibility and usability of this website for all people with disabilities. We will continue to implement the relevant portions of the World Wide Web Consortium's Web Content Accessibility Guidelines 2.0 Level AA (WCAG 2.0 AA) or such other standards as required by the Americans with Disabilities Act (ADA). On a periodic basis, our website will be tested with assistive technology. Please be aware that our efforts are ongoing. 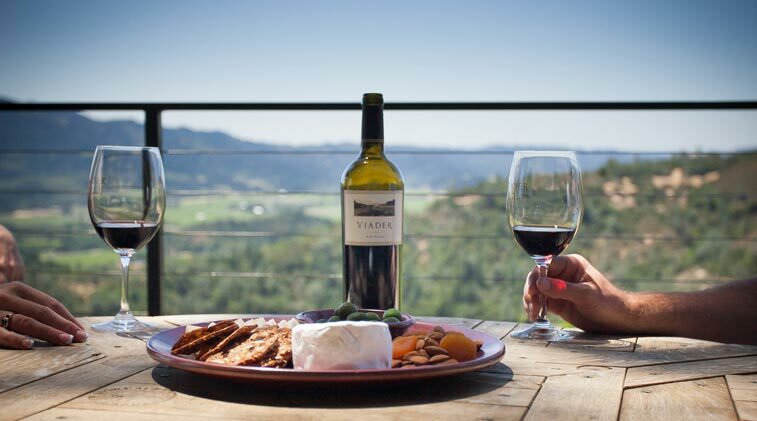 You may email us at info@lodginginnapavalley.com or call us 24/7 at (800) 572-0679 with questions or concerns regarding ADA accessibility, including issues accessing the website or with questions regarding the accessibility and personal needs of the various rooms.